Caernarfon is an historical town located in north-east Wales. It is famous for the imposing and magnificent Caernarfon Castle, one of King Edward I’s famous castles, but its name derives from the time that it was a Roman fortification. Caernarfon was named Segontium in Roman times but it was an important strategic post against Ynys Môn (now known as the the Isle of Anglesey) and thus the current name derives from the Welsh name "y gaer yn Arfon" which means "the stronghold in the land over against Môn". There is evidence that Caernarfon has been inhabited since pre-historic times by the Celtic tribe the Ordovices. The Ordovices were subjugated by the Romans and used in their battles against the druids living on Môn. Môn was also known as the isle of Mona and historians might know that Roman governor Gaius Suetonius Paulinus moved on from the absolute destruction and devastation of Mona to defeating Queen Boudica in the battle of Watling Street in 60 or 61AD. I would apologise for the impromptu history lesson but I am fascinated with anything to do with Boudica! Caernarfon is a special treat for a castle lover like me because in addition to the magnificent castle, the town itself is surrounded by town walls that were built at the time the castle was built (1283-1285). The photo at the top shows the view looking north, towards Anglesey. You can see the famous Market Hall which was built in 1832. If you click on the photo, you will be able to see the northern walls in the distance. The photo above shows the view of the East Gate, one of two original entrances to the town. 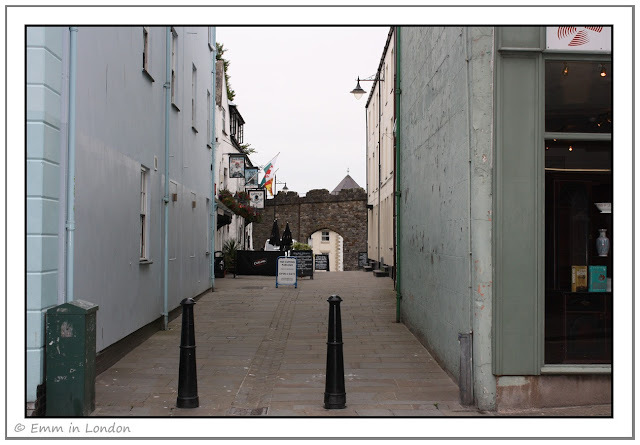 Caernarfon has extended beyond the boundaries of the town walls and that is the road you would take to access the new town. Another view of the northern wall. 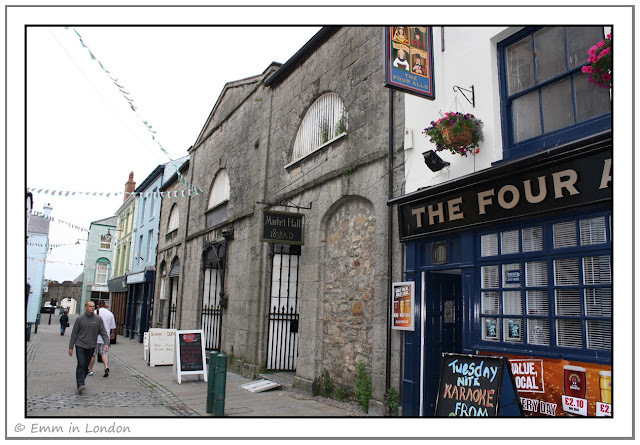 On the left, you can find the Black Boy Inn which was built circa 1522. You can still stay at the inn, giving you the privilege of staying within the town walls, and you may or may not be happy to know that the price of a room no longer includes a free bottle of gin and the services of a young lady for the night. 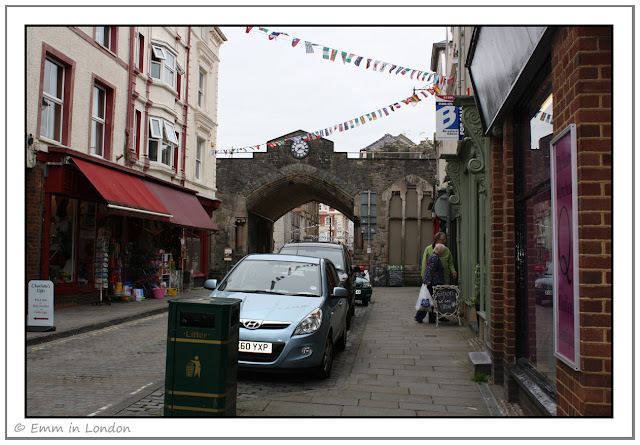 On the inn’s website, they say that the archway through the wall was not part of the original design but was only added in the 19th century to aid the flow of traffic in and out of the old town. This is the north-eastern tower of the town walls. It is one of the eight towers and is in remarkable condition given that it was built over 725 years ago! It is difficult to see, but the tower is still mostly intact and you can get a better idea of the intact state of the entire wall by checking out this aerial view on Bing maps. This is the view to the west, showing the West or Water Gate. In 1854, the The Royal Welsh Yacht Club took the West Gate as its clubhouse. 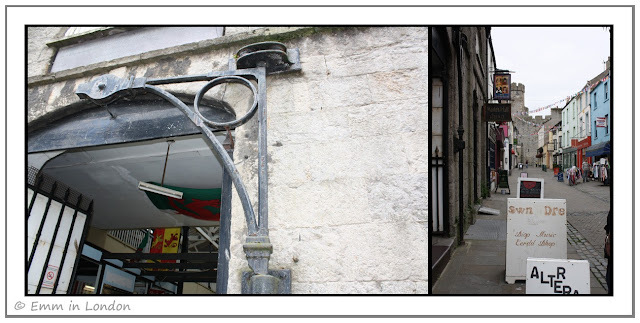 The old Market Hall is still in use today although I doubt that they still use this old lifting mechanism. I love seeing old contraptions like this though. 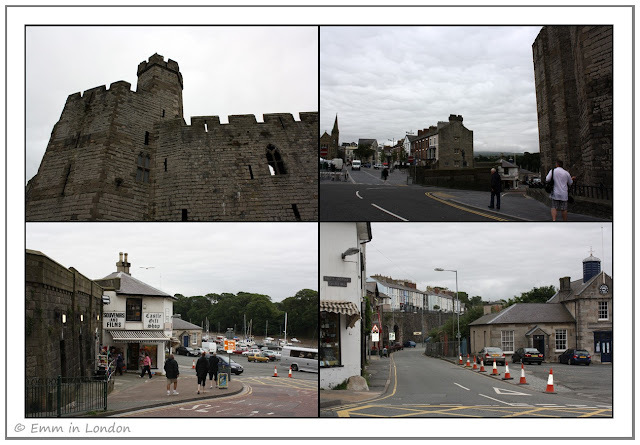 Having explored north, east and west within the old town walls of Caernarfon, it was time to head south, towards the grand Caernarfon Castle. 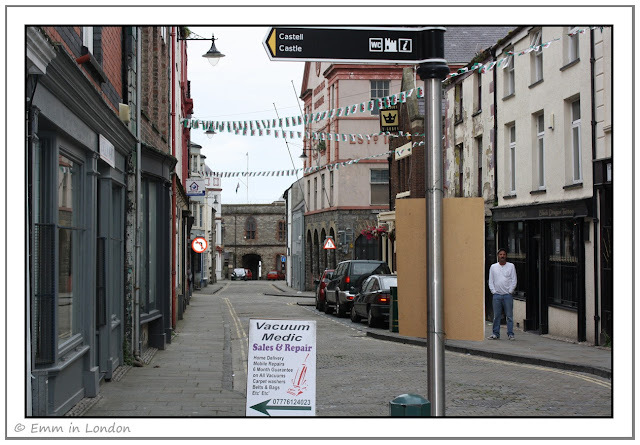 I love the photo above with the narrow street, shops, pub and castle up ahead. There is something unmistakeably Welsh about the scene, especially when you notice the bilingual signs everywhere. 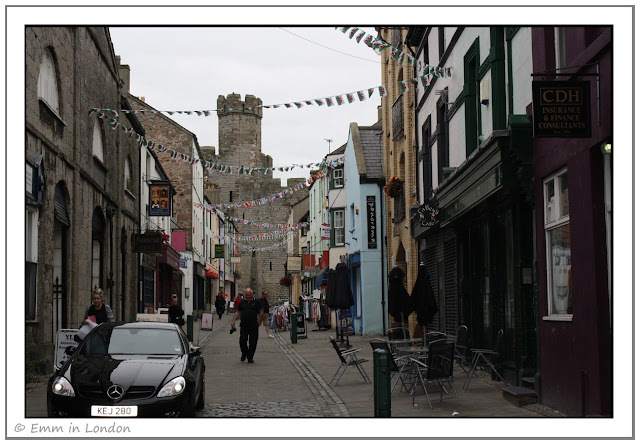 The new town of Caernarfon seems almost plain in comparison to the charming old town that resides within the town walls. I do not know much about this Roman part of history but I like the remains of the castle! Have a nice rest of the week! Thanks for the post it made me feel sorry I missed out on Caernarfon last time I went to Wales, there are so many lovely castle towns on the borders particularly. Very pretty little town. One day I will make it to GB :) Have a great Wednesday, Em! This little town is full of interesting characters! At least you know you're in Britain?! HA! Another amazing tour Emm, but one thing threw me off. 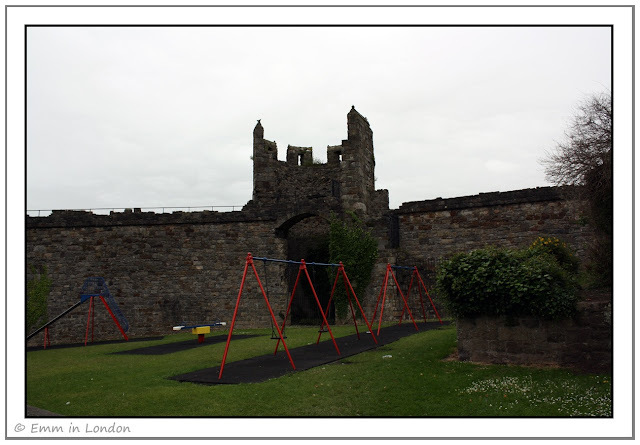 Why does the child's play area seem oddly placed, right next to a fortification in the fourth pic? I love that shot of the castle through the town- it looks like a movie set. Great tour! Beautiful old town and castle. That tower look a bit like Tower of David in the last picture. Oh this town is so historic isnt it. I love it. Would love to live here! SO cool! I haven't been to Wales or Scotland yet, but must go! I always loved the unique charm of Europe. Although the streets are so narrow and doesn't provide much space for parking. I imagine those who live within the walls don't own a car and just walk from place to place. I love learning history, great post with great pics. A great﻿ series of photos, Emm. Beautiful place and those old castles look intriguing. thanks for sharing your wonderful journey. I love Caernarfon, it's such a lovely place to visit, though I do think that a lot of damage is been caused to the wonderful walled town by all the traffic that goes through it everyday. Caernarfon definitely looks like the type of town I would enjoy visiting - history, castles and old pubs does it get any better than that. I have barely been to Wales (Cardiff), but I see that I have to visit Caernarfon, famous for a lot of things. PS Thank you for the nice comments! @ Ola: Thank you! I'm enjoying learning about the history. @ Jenny: You definitely missed out on Caernarfon! It is a lovely place. @ Ivanhoe: It is lovely. You have to make a turn here one day! @ London Calling: The weather is always rubbish when I'm trying to get decent photos! These were meant to be our summer holidays! @ Ancient Digger: The castle walls are a fixed feature and part of the old town. They tend to make use of as much space as they can and if there is a rare, unused corner, then what better use than a playground?? @ Danielle: Yes, the city is really picturesque and like a movie set! @ John: You'll have to visit there next time! @ Spiderdama: Caernarfon Castle is quite impressive! I must post my pics of it soon! @ Tina: I prefer visiting small towns to living in them!! @ Within Ireland: I would absolutely recommend both Scotland and Wales, as well as Isle of Wight!! 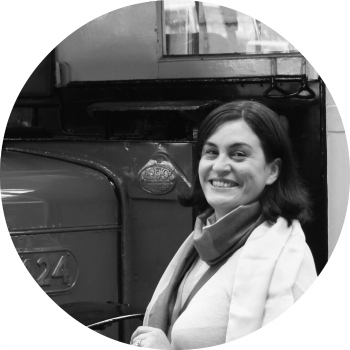 @ Avcr8teur: There was a massive car park on the other side of the castle and then everything else was within walking distance. @ Ryan: Me too! Thank you. @ Life Ramblings: Thank you! It is such a beautiful town. @ Karen: it must be amazing living in Wales, with such natural beauty and abundant history! @ RuneE: Definitely! Wales can vary greatly depending on whether you visit the north or south.